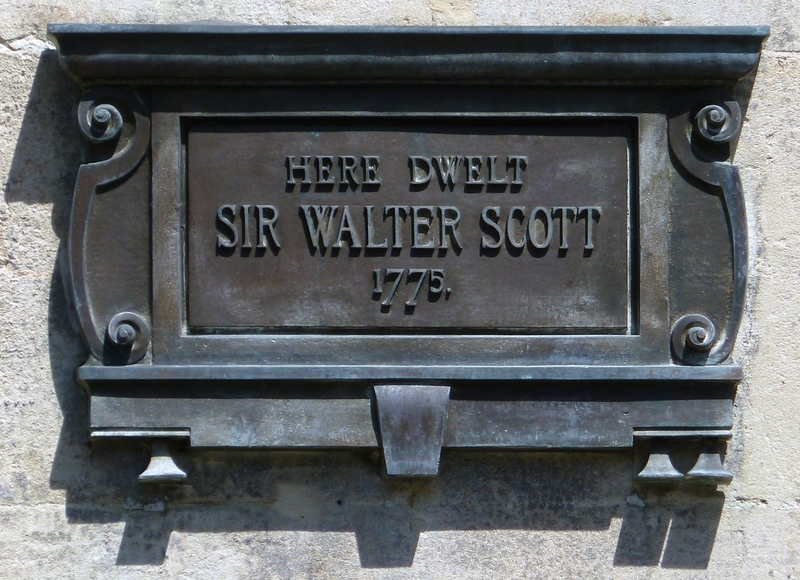 As is well known to enthusiasts of Scott’s life and works, in the early summer of 1775 when he was almost four years old, he was taken to Bath by his paternal Aunt Jenny (Miss Janet Scott, born 1733), in the hope that the muscle weakness in his leg, the result of poliomyelitis contracted in infancy, would respond to the curative regimen at the spa resort of the city of Bath — immersion in the waters of the mineral-rich hot springs (unique in the British Isles), and drinking it daily in measured doses. Here we add that the latest incarnation of the spa, used by the Celts and the Romans over two thousand years ago, is the Thermæ Bath Spa, which Wattie would undoubtedly have enjoyed far more than the late-18th century facilities. Wattie and Aunt Jenny travelled by packet boat from Leith to London, and after the twelve-day passage spent a few days seeing the sights, including Westminster Abbey and the Tower of London. From there it was westwards to Bath in the English county of Somerset. There Janet Scott took lodgings for them both at fashionable South Parade, No. 6, designed and built by Wood the Elder. Wattie’s stay at Bath was happy and formative: in addition to his spa routines, he attended a nearby dame school (he could already read); frequented the gorgeous toy shop at Orange Grove, near the Abbey; played in Parade Gardens (still very fine); and took carriage drives on the Downs, with the wife of the Rev. John Home, where he would have seen wildflowers, wooded plantations, and noticed the fine views over the City. With his uncle, Capt. Robert Scott who joined them at Bath, he attended his first play, As You Like It, and was entranced. It was an idyllic year by any measure. Plaque affixed to the front elevation of No. 6 South Parade, Bath. where the dimensions of the pavers are: short pavers (S): 20 inches square; long pavers (L): 25 x 20 inches. Far easier to start a course at one side and finish a repetitive pattern at the other, but no, these paviors took full advantage of the freedom given them, and this unique public space, to display their talents. Even a precocious child, which Wattie undoubtedly was, would have been unaware of what strikes the Idler, but there can be no doubt that he must have enjoyed the sights, sounds, and spaciousness of South Parade where the fashionable came to see and be seen, altogether très à la mode. No. 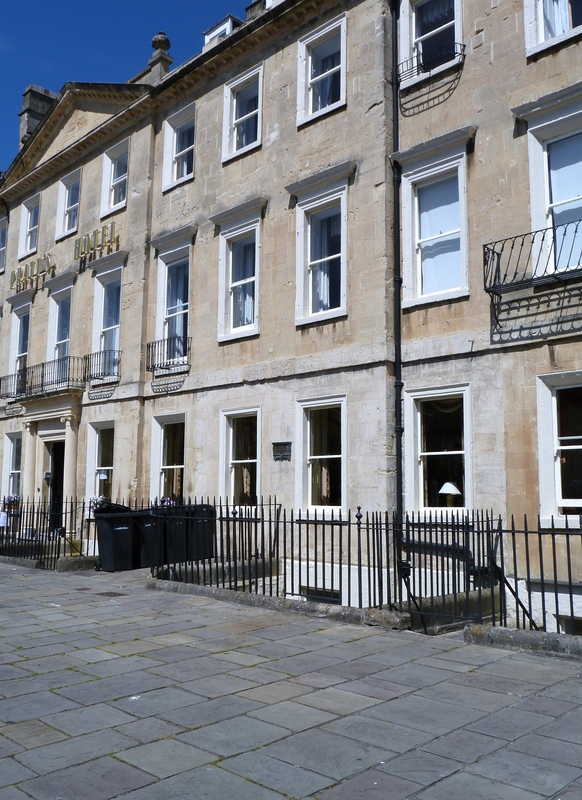 6 South Parade, Bath, has been incorporated into Pratt’s Hotel. The entrance door to No. 6, to the left of the SWS plaque, has been converted to a window. Each property has three bays. 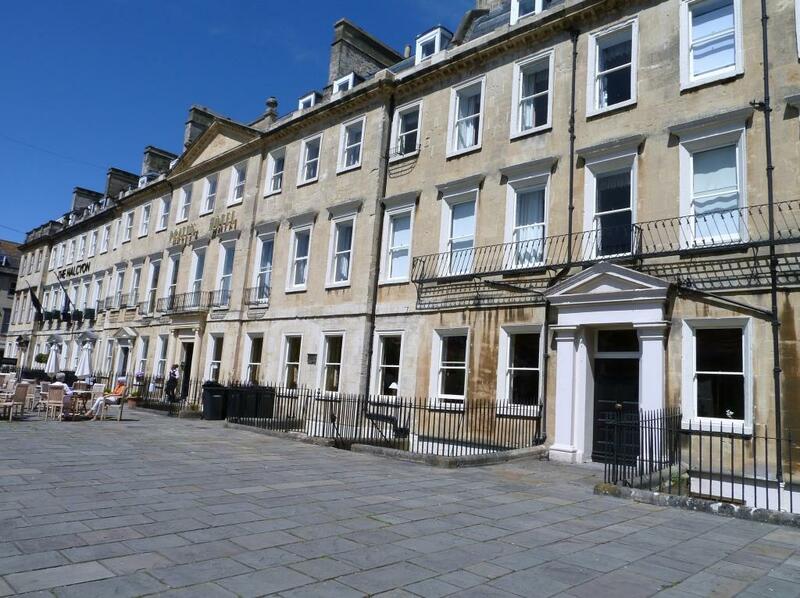 Although there is a pediment above the three bays of the central section, South Parade is not a palace front, as may be seen from the irregular height of the first floor cills. No. 6 has the plainer sort, without balconets. Having once deciphered the sample course of pavers, the question of whether the spacious dimensions of South Parade might be viewed as a metaphor for the spaciousness of the Waverley novels was one that struck the Idler. It seemed a far-fetched reflection, and probably was, but to the Idler in proper mood, the idea had a certain attraction. 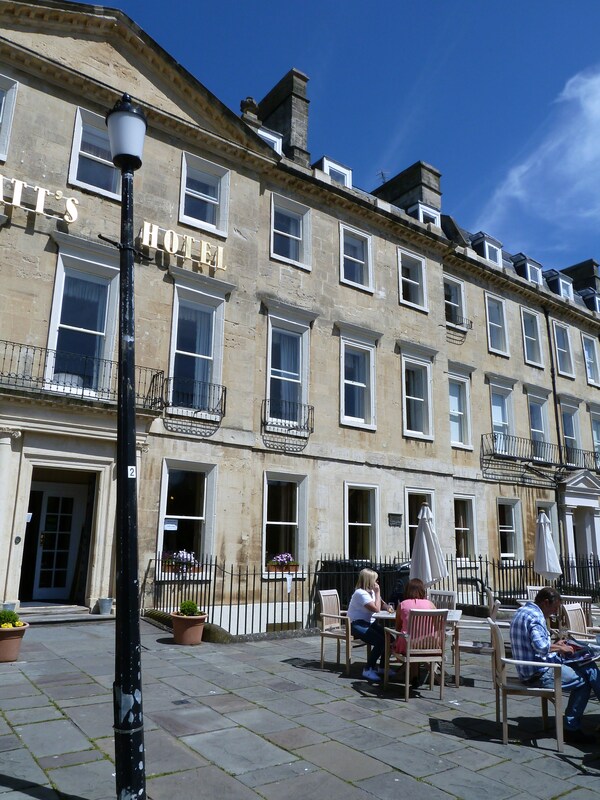 For many months during the year Bath is blessed with an abundance of mild and sunny weather, and when not otherwise occupied, the small boy would have played and idled here on South Parade, watching society promenading up and down, and absorbing the atmosphere without appearing to, as is the way of observant, thoughtful children. No. 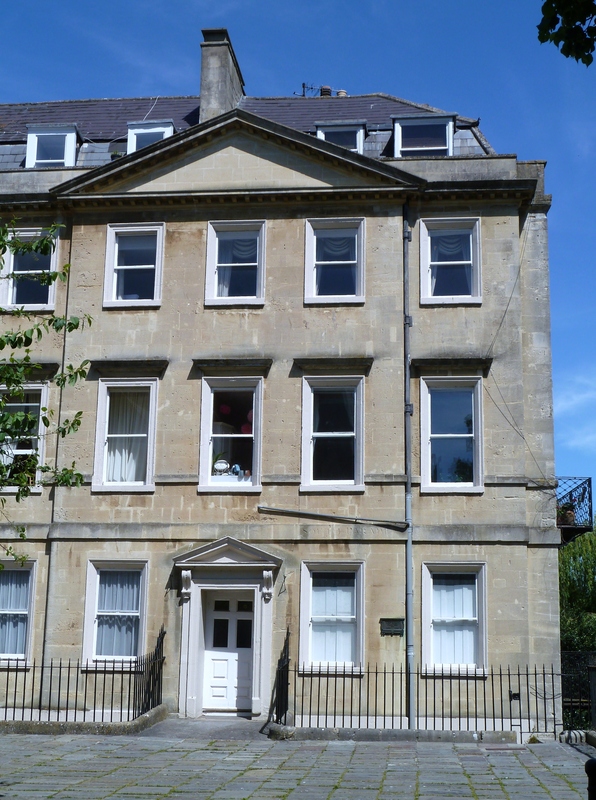 14 South Parade, Bath, front elevation. Here resided madame d’Arblay née Frances (Fanny) Burney (1752–1840). She is recognised as a literary pioneer in the art of the novel of manners.
. Granted city status by Queen Elizabeth I in 1590.
. See Edgar Johnson, Sir Walter Scott The Great Unknown. London: Hamish Hamilton, 1976, Vol. I, 20–23.
. See Internet, “Thermæ Bath Spa” https://www.thermaebathspa.com (accessed 1 April 2016). Except, of course, that children under twelve years of age are not admitted.
. John Wood the Elder (1704–54), architect. He began the development of North and South Parades, Bath, in 1738, which “achieved pre-eminence among the places of fashionable resort in the city.” (Thomas Moule, 1837; Robert Gilding, Historic Public Parks - Bath (1997), pp 1–7). See Internet, “Parade Gardens, Bath” https://historicengland.org.uk/listing/the-list/list-entry/1001630 (accessed 1 April 2016).
. John Home (1722–1808), Scottish Minister, writer, and playwright. He is best known for his poetic tragedy for the stage, Douglas.
. Shakespeare, As You Like It, Act 4, Scene 1.
. The Rev John Penrose wrote on the subject in 1766 and 1767, comparing paving in Bath to a ‘floored room’. Bridget Falconer-Salkeld is a Life Member of the Edinburgh Sir Walter Scott Club and a postgraduate of the University of London, School of Advanced Study.